17th July 1990 2000 Recently transferred from Bristol. As much as I miss the old local liveries there is a good case to be made for having one single national fleet livery. It was always very clear that First Western National was receiving hand-me-downs from other fleets. 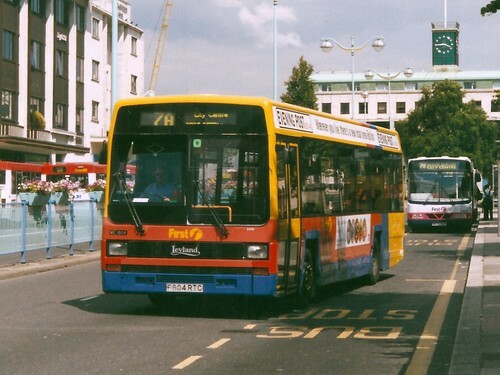 The Leyland Lynx’s were operating in full Bristol livery for quite some time. They did brighten the place up somewhat, but they were clearly placed into service in a hurry, as they didn't even bother to remove the Bristol adverts. Not a good impression at all. Things are done in a much more professional manner these days. I don't suppose many passengers would notice if their bus had just arrived from up country. Still, you cant help but miss the splash of colour! Sorry for nit-picking, but wasn't that photo taken a lot later than 1990? First Group were only founded in 1995, and the Barbie liveries didn't start appearing until about 1999-2000. Also, in the top left there's the words Lloyds TSB on the building, with those two banks also merging in 1995. OOPS - should be 17th July 2000 - can't remember where I was on 17/07/90 - but it was probably in the Rhymney Valley council offices and certainly not Plymouth! woops - should have noticed that myself too. Full marks for Doddy for observation! !